What is left of our Olympic legacy? The Olympic Park in East London should be a remarkable place the organisation in charge of the site – the London Legacy Development Corporation (LLDC) – had a chance to build a neighbourhood from the ground up. And Londoners were promised a ‘paradise for cycling’. 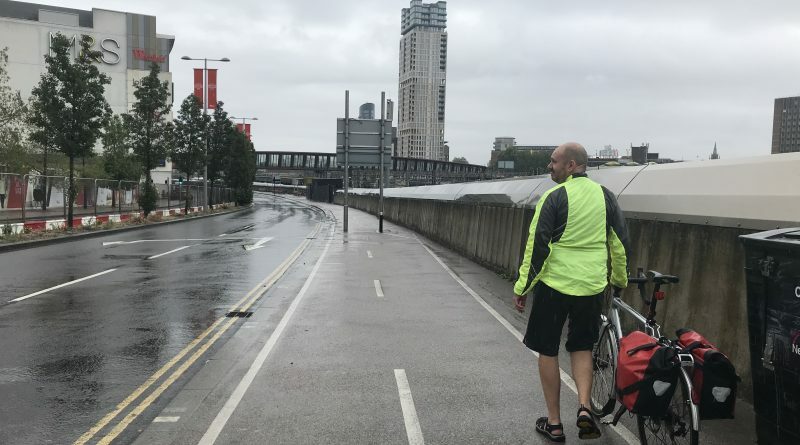 I visited the Olympic Park with Simon Munk from London Cycling Campaign, to check up on its cycling legacy and to see beyond the velodrome, what’s available for people making every day journeys by bike on and through the Park? What I saw was shockingly bad – I saw a lot of hostile roads and dual carriageways which were hard to cross and unpleasant to cycle on. It seems the Park is being opened up to more cars and vehicle traffic and closed off to everyday journeys by people walking and cycling. 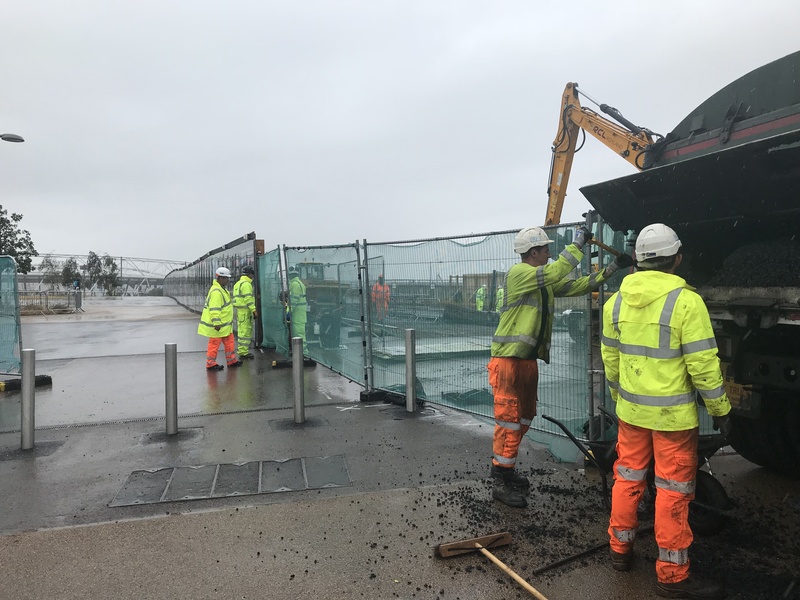 The LLDC are in the process of ripping out a pedestrian and cycle route for the new north south highway, and new roads always bring new traffic. This road will become actively hostile as the planned cycle lane will only be advisory – ie a dotted line painted on the road rather than a proper, segregated route. A slap in the face to the people who used to use this space to walk and cycle. The Park is also incoherent by bike, with cycle lanes disappearing at junctions or even in the middle of the road. On Montfichet Road – which runs along to the tube entrance at Stratford Westfield – a bidirectional cycle track has had cycle hire racks built on top of it. Yes, you read that right, cycle hire racks build OVER the cycle lane – rendering it unuseable. This comedy of errors continued as I toured around the Park, Westfield Avenue (near Montfichet Road junction) has a new development with a two-bay carpark. To pass along the public footway you have to stop twice, and wait for a green man, twice, so as not to impede traffic accessing this miniscule carpark. This is not putting pedestrians first – something I found particularly frustrating as it was pouring down during my tour and I timed waiting for the green man – nearly a whole minute of being drenched. Mike Brown, TfL commissioner, confirmed that people should be top of the food chain when it comes to designing streetscapes so how has this happened? Last week I asked Lyn Garner – the new chief exec of the LLDC about these issues – and what could be done about them. The North-South route for East Wick and Sweetwater – could LLDC look again at the route and cycling provision as there is just an advisory cycle lane at present? Are Healthy Streets in the LLDC design standards? Are the LLDC giving guidance to developers in line with Healthy Street objectives – and can they share that guidance with me? An audit of what has been built for aligning with aspirations of Healthy Streets/audit of what’s already been installed and what your aspirations are? Lyn seemed open to these plans – and as the new CEO of the LLDC is positioned to lead it in a much more cycle-friendly direction, that is in line with the Mayor’s transport strategy. From our exchange it was also clear she is building stronger links with the boroughs. I’m waiting to hear back from the LLDC about when the audit will happen so watch this space! ← Are the wheels coming off the Mayor’s cycle lane programme?